With its high proportion of coal and gas producers, the ASX All Australian 50 index has been rated the most exposed market to potential stranded [fossil fuel] assets. These are coal, oil and gas reserves that cannot be burnt if we want to stay well below two degrees of warming. In stark contrast to ASX’s silence on climate change, Market Forces Investing in the Dark research shows that the majority of ASX100 companies accept the science of climate change. However, when pressed on the serious risks climate change could have on ASX’s business, the chairman claimed he had read articles that said “over the next 20 years there are positive things happening”. Although he then admitted he had no idea of the implications. 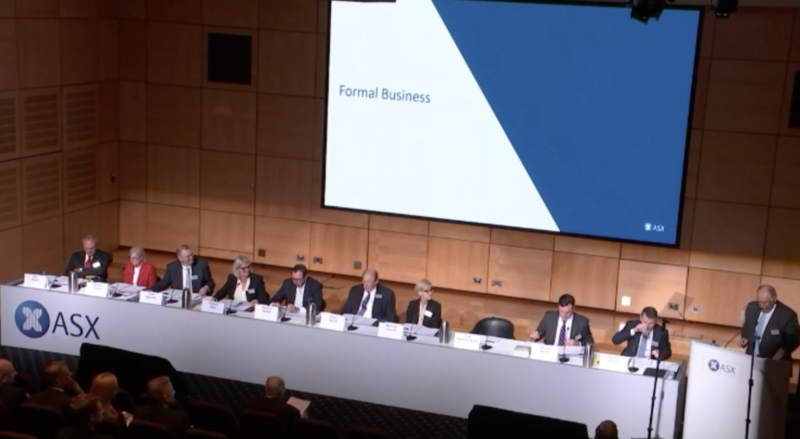 When asked by a shareholder if the ASX’s business strategy was consistent with two degrees of warming, the chairman re-iterated again that climate change did not pose a material business risk to the company. He explained that the company tried to have green buildings and use recycled paper where they can, but did not see how climate change would be a financial risk to the company. Again, it was made clear that ASX considered climate risk to be confined to individual companies, rather than the wider market. The ASX needs to be doing more to manage climate risk – as do most companies on the ASX. Click here to call on your superfund to enforce climate risk management.